Hello hi, this has been a bit of a long time coming as a lot of you have been watching my meal prepping on Instagram and have requested a blog post... weeks ago. I've been sort of putting if off, as there's so many little things I wanted to share, but didn't have the time to sit down and write it all out until now! So, here's everything I've learned from weeks of prepping and some recipes that work well too. Let's start with the basics though, why do it at all? When planning out your meals, you save a lot of money by just purchasing what you need rather than filling your fridge or cupboards with things you *might* use. I used to frequently do big £70 food shops and still have nothing to eat because I'd bought things that didn't really go together. Now I spend around £25 a week (for 2 people) and have meals to enjoy every day, as well as some lunches. 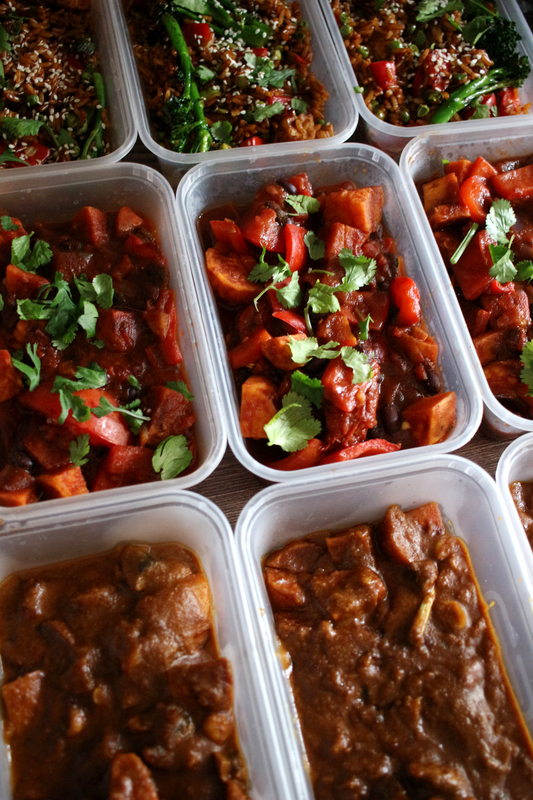 You'll order less takeaway and probably spend less on snacks if you have meals already prepped to fill you up. I was really sick of cooking every single night, especially as Phil comes home quite late sometimes so the idea of starting everything at 7pm is not very appealing. On average, I used to spend between 45-60 minutes per night cooking and then cleaning the kitchen every single night. Over a week, this is up to 7hrs of my life spend making food (not including lunches) which is a hell of a lot of time! Now, I can spend 2hours at a weekend and have meals for the entire week, which saves me oh so much time and stress throughout the week. As we're all trying to be a bit more eco-conscious these days, I think meal-prepping is a great way to reduce your waste and energy consumption. If you're only using your oven/hob for 2 hours a week rather than 30 minutes every single night (plus the clean up afterwards), then you should in theory reduce your bills. Similarly with food waste, as you're only buying what you need to cook with! The following recipes are my tried and tested favourites which all reheat well, taste really good and can be made in larger portions. Recipe uses chicken, but I just roast some mushrooms, courgette and red pepper instead. My favourite recipe ever. I marinate sweet potato, mushrooms and courgette as instructed, then roast them for 15 minutes while I prepare the sauce. Again, good old mushrooms are great for this. Sub chicken for red peppers, tofu and mushroom. Legit delicious. Pick up a pack of naan breads for your freezer, too. I hate Jamie Oliver, but he makes a good chilli. I double the spices and roast the veg for 15mins prior. A good staple and packed full of health (much health). My current fave lunch option. You could swap for any veg you like or any sauce combo. I add sriracha, everything needs hot sauce. Literally takes 10-15mins and tastes amazing. Takes a while to good, but is sooo good with garlic bread! Throw it in the slow cooker if you fancy. Also get the pre-chopped 'soup mix' bag of sweet potato/butternut from Tesco, it'll save you 15mins of chopping time and is only £1. So easy and made in 10mins. I don't use olives/capers, but this makes a great lunch or evening meal! I get 6 portions out of this recipe! If you need comfort food, this is the one. A long-term staple in my diet tbh. A newbie, but a goodie. Delicious and requires minimal effort. A Madeleine Shaw recipe that I've made about 100x. I've had it with chicken and without and it's deeelicious either way. So good, very easy, just don't overcook the rice or it'll taste weird. Polly really served up the goods with this recipe. I double it and throw it all in the slow cooker. I also use 2x jars of Lloyd Grossman tomato and chilli sauce and omit the olives. It's the only time I eat meat in the house, shh. Great for lunch with greek yoghurt and coriander ontop. For tea, you could poach a few eggs and pre-roast some sweet potato wedges to have with it. Make 4 and get 2 days worth of food - delicious. Note: You can add/remove any ingredient you want in these recipes too! I find chilli/curry a great way to throw in extra veg, so it's nice to have a few bags of peas, sweetcorn, edamame etc in the freezer. It's kinda hard to start meal prepping if you're not sure how to approach the meal planning side of things. Picking meals that work well together gets easier, but you need to think of a) recipes that can be made in bulk and b) things that will reheat well or are nice served cold and c) can be frozen. It's good to pick a mix of meals that can be cooked in different ways too, as this will cut down on time. If you've got one meal on the hob, one in the oven and one in a slow cooker (for example, you may not have one and I don't always use mine) you could have all of your meals done for the week in an hour or so. If you choose meals that all take 45 minutes and are all made on the hob, then it will take you much longer unless you have multiple large pans (I don't). So, choosing something like a curry or chilli (hob), a lasagne (oven) and then something else in a slow cooker or another oven item, you can really cut down on time and energy used. You also need to think about how many meals you need for the week. If you're just cooking for yourself and only need evening meals, then you could prep 2 meals with 3-4 portions per meal and you would be done. If you're cooking for more than one person, you would then need to figure out what recipes give you the right portions. As a sidenote, I don't pre-cook rice unless it's already mixed into the dish, so I spend 10 minutes per night making rice if it's required. I also wouldn't bother pre-cutting salad etc as it'll go off quicker and it takes no time to prep on the night! So, you've planned your meals and need to get your food. Having everything written down is great as you tend to just buy what you need which saves a lot of money. Knowing that your one garlic bulb will last for 3 meals or how many tins of tomatoes you need exactly just makes my brain feel better, you know? If you follow me on Instagram, then you'll know my kitchen is super tiny and I don't have a lot of room for non-essentials so buying and then immediately using my purchases is great for me! Ok, now you've got your food and you're ready to go. Here are a few tips I've learned from doing this for the past 6-7 weeks. If you don't have a lot of space and have 4 meals to prepare, having a messy kitchen will make things harder you'll want to give up. I make sure I have an empty dishwasher so I can pop things straight in if I don't need them for another recipe, and a clear sink so I can wash pans straight away. Start with clean kitchen benches, utensils and hob! I picked up some boxes with my Tesco shop (£2 for 8) and they're not the most sturdy in the world, but they stack really well in my tiny fridge! Also, only get out the ingredients that you need for one particular recipe at a time otherwise it'll get messy really fast! I only cook vegetarian in the house, so meals last around 4 days in the fridge for me. So, I would need a total of 12 portions in the fridge for 4x evening meals and 4x lunch. Any meals with rice already cooked, we eat first. The other meals can go in the freezer to be defrosted overnight. You've planned, your purchased, you've prepared your kitchen and now it's time to cook. But What to Cook First? Prep the vegetables for the lasagna in 1 bowl and the vegetables for the chilli in another bowl. Get out ingredients for the chilli and start doing the first few steps. When cooked, take out the vegetables. Set the lasagna ones aside and continue doing the prep work (about 10mins) on the chilli until it's ready to leave it cooking on the hob. Set timer for around 50mins. Get out the lasagne ingredients and assemble. Place back in the oven and set a timer for 40-ish mins. Now you'll have 3 meals made in just over an hour with minimal effort! If you're cooking with meat, obviously make sure it's cooked through. If cooking with veg, make sure a knife can *just* go through it and don't wait until sweet potato (for example) is ultra soft, otherwise it will go mushy when you reheat it. Make sure everything still has enough bite! Same with pasta. As mentioned above, I don't cook rice in advance unless it's mixed into the meal as you have to be careful about reheating rice. If you make a ragu, you can always make pasta on the night. It takes 10mins and 1 pan, so it's still very low effort. I would only pre-prep salad the night before if I really wanted it for a lunch and I had no time, otherwise I would make it just before eating. I do work from home though, so I have a bit more time and a full kitchen for this kinda thing. It doesn't have to be boring, too. You can alternative between means and if you're cooking 3 or 4, you don't have to have the same meal for daaays which makes it much better. You can also add things in such as cooking salmon for 20mins to go with your veggie rice or making a garlic bread or putting chilli on toast for lunch. You can be as inventive as you like! I hope this blog post has been helpful and can be put to use by those who want to start meal prepping, even if it's just a meal or two a week. It honestly saves so much time that I get mad if I have to cook on an evening like a normal person, as it just feels like such an effort haha.